What Is FBI Moneypak Ransomware and What Does It Do? 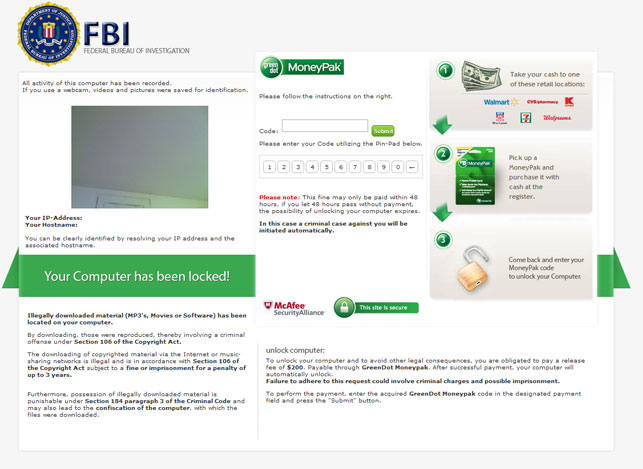 FBI Moneypak ransomware is a typical ransomware infection that once installed will display a fake FBI message in order to scare the victim and make him pay the required sum via MoneyPak. FBI Moneypak ransomware is similar to PCEU ransomware, the Gema Virus and Buma Stemra Virus. The threat can be eliminated through the same AV products used to remove the above-mentioned ransomware. All of these infections have the same pattern of behavior. The message displayed by FBI Moneypak ransomware claims that the victim’s system has been locked because of crimes involving intellectual property, for example, downloading illegal mp3s. The ransomware message even states that the alleged illegal activities have been recorded. Experts assure you that the displayed message has nothing to do with the authorities. FBI Moneypak ransomware will try to block your access to the majority of the programs on the compromised machine, as long as the ransomware is active. What you can do is boot your PC and scan the system with a legit anti-malware product to remove the infection from your computer. Download a FREE System Scanner, and remove FBI Moneypak Ransomware. FBI Moneypak ransomware, just like many other threats from the same type, is usually distributed through spam email messages or malicious websites. Either way, once activated it will lock the screen of your computer, display a ransom message on your desktop and demand a fee to unlock the machine and the compromised files and documents. The cyber criminals went so far as to even suggesting a few retailers that support the MonyPak service, in the ransomware note. Paying the fee is supposed to set your PC free, but security experts recommend you do not pay the required sum, because there is no guarantee that you will have your computer unlocked if you do hand your money to the crooks. How to Remove FBI Moneypak Ransomware from Your PC? Boot your PC from a removable hard drive to prevent the activation of malicious Registry entries. If needed, use Safe Mode in order to minimize the risk of activating potential threats as you start Windows. Scan your system with a trustworthy anti-malware product for free. Follow the steps provided below to delete FBI Moneypak Ransomware from your computer permanently. 1. Start Your PC in Safe Mode to Remove FBI Moneypak Ransomware. 2. Remove FBI Moneypak Ransomware automatically with Spy Hunter Malware - Removal Tool. 2. Remove FBI Moneypak Ransomware automatically with Spy Hunter Malware – Removal Tool. Threats such as FBI Moneypak Ransomware may be persistent. They tend to re-appear if not fully deleted. A malware removal tool like Combo Cleaner will help you to remove malicious programs, saving you the time and the struggle of tracking down numerous malicious files. Threats such as FBI Moneypak Ransomware may be persistent on your system. They tend to re-appear if not fully deleted. A malware removal tool like SpyHunter will help you to remove malicious programs, saving you the time and the struggle of tracking down numerous malicious files. Note! Your computer system may be affected by FBI Moneypak Ransomware and other threats. SpyHunter is a powerful malware removal tool designed to help users with in-depth system security analysis, detection and removal of threats such as FBI Moneypak Ransomware. 1. Install SpyHunter to scan for FBI Moneypak Ransomware and remove them. 2. Scan with SpyHunter, Detect and Remove FBI Moneypak Ransomware. Ransomware infections and FBI Moneypak Ransomware aim to encrypt your files using an encryption algorithm which may be very difficult to decrypt. This is why we have suggested several alternative methods that may help you go around direct decryption and try to restore your files. Bear in mind that these methods may not be 100% effective but may also help you a little or a lot in different situations. Note! Your computer system may be affected by FBI Moneypak Ransomware or other threats. Remove FBI Moneypak Ransomware by cleaning your Browser and Registry. Fix registry entries created by FBI Moneypak Ransomware on your PC. Combo Cleaner is a powerful malware removal tool designed to help users with in-depth system security analysis, detection and removal of threats such as FBI Moneypak Ransomware. Step 5: In the Applications menu, look for any suspicious app or an app with a name, similar or identical to FBI Moneypak Ransomware. If you find it, right-click on the app and select “Move to Trash”. Step 6: Select Accounts, after which click on the Login Items preference. Your Mac will then show you a list of items that start automatically when you log in. Look for any suspicious apps identical or similar to FBI Moneypak Ransomware. Check the app you want to stop from running automatically and then select on the Minus (“–“) icon to hide it. Remove FBI Moneypak Ransomware – related extensions from your Mac’s browsers. A pop-up window will appear asking for confirmation to uninstall the extension. Select ‘Uninstall’ again, and the FBI Moneypak Ransomware will be removed. When you are facing problems on your Mac as a result of unwanted scripts and programs such as FBI Moneypak Ransomware, the recommended way of eliminating the threat is by using an anti-malware program. Combo Cleaner offers advanced security features along with other modules that will improve your Mac’s security and protect it in the future. Hey !, I found this information for you: "Remove FBI Moneypak Ransomware from Your PC". Here is the website link: https://sensorstechforum.com/remove-fbi-moneypak-ransomware-from-your-pc/. Thank you.